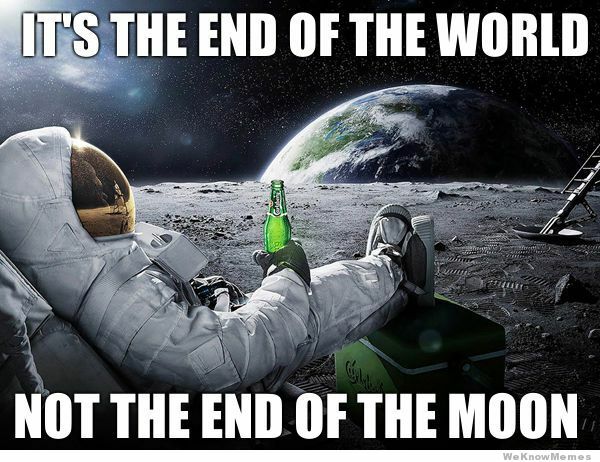 pseudoparanormal: End of the World....Maybe? The idea behind some premonitions of “The End of the World” have focused on vague assumptions on things that could happen years ahead of their time. For example, the iconic Mayan prediction of the end of the world happened thousands of years ago and believed that 2012 was the year that the world would end, but, here we are in 2018 still alive. Another example, as mentioned in the lecture, was Jeane Dixon's prediction that the world would end between 2020 and 2037. Oddly enough this prediction has such a large range of years which inevitably increases the “chance” of the world possibly ending. In other cases of “The End of the World” premonitions, whenever people were wrong about prophecies, they simply said that it would happen at a different time in the future. For example, Chris McCann and Harold Camping both believed that the world would end in October of 2011 but when they were wrong, McCann changed the date to October 7th, 2015, again, still no end of the world. With countless of false prophecies, it easy to see how it has become a marketable strategy in today's world. Premonitions, prophecies, and predictions of the end of the world have become heavily used in pop culture today. With movies like 2012, Knowing, This is the End, Legion, or Seeking a Friend at the End of the World, the idea of the, "End of the World," is something that has become fairly common and not a taboo to talk about. The use of the "End of the World" even went so far as to be a part of the Chevy car commercial (Link below). 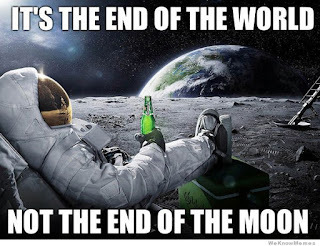 Thank you for sharing your posts about the end of the world. It is interesting to think how many "end of the world" days we already lived through growing up. I was 8 years old during the Y2K scares. I remember January 1st, 2000 very vividly. My little sister was born around midnight in the early morning just as the century changed over so my day consisted of new sibling duties and visiting my mother in AtlantiCare hospital. I survived the end of the Mayan calendar while at work at Target. For me, the end of the world was always just a normal day. I see the predictions of the end of the world as "a stab in the dark" that is made over and over again because as you mentioned, these end of the world prophecies are "a marketable strategy in the world today". You listed various movies in pop culture that all cling on the idea of the end of the world and the industry of making money off these ideas is paying off ( They will make more movies of a similar theme in the future if they keep making money). Thanks again for the thought provoking post Vinh! I hope your having a great summer brother !